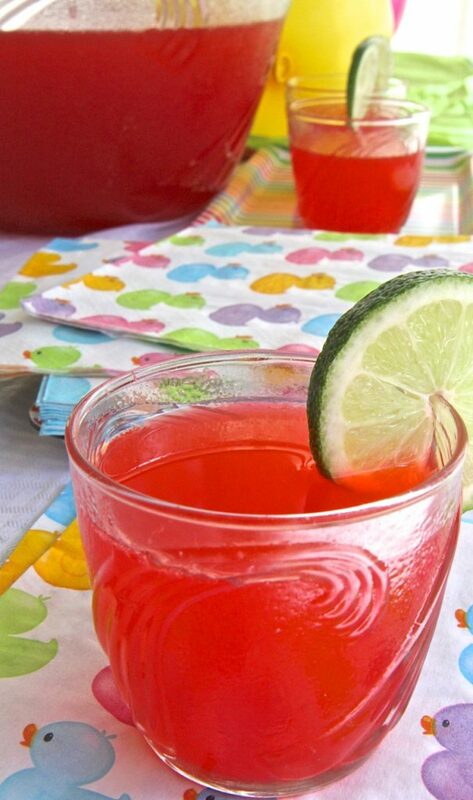 Watch me make this easy party fruit punch from start to finish! Party time!! Is it possible to have too many punch recipes? 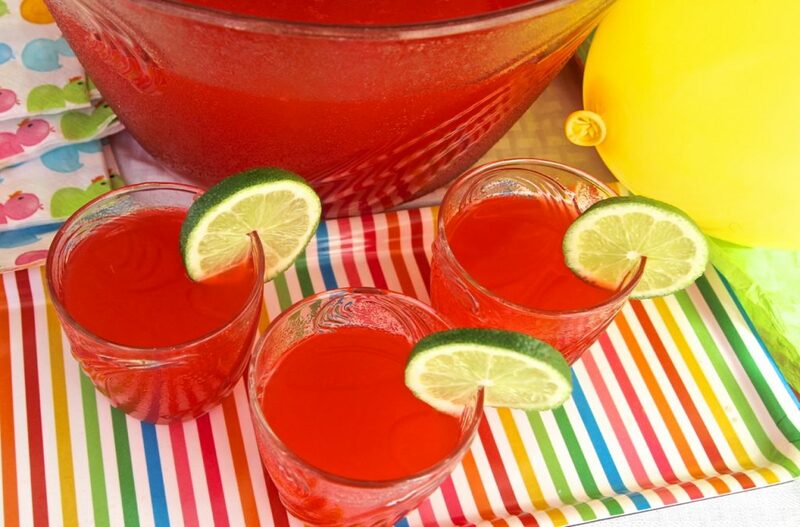 A really good party punch recipe can save even the dullest parties! I can’t tell you how many boring parties I’ve been to with blah punch! I’ve wanted so badly to slip them a really good punch recipe but nobody wants to be “that person”. If you haven’t figure it out by now, I LOVE punches!! 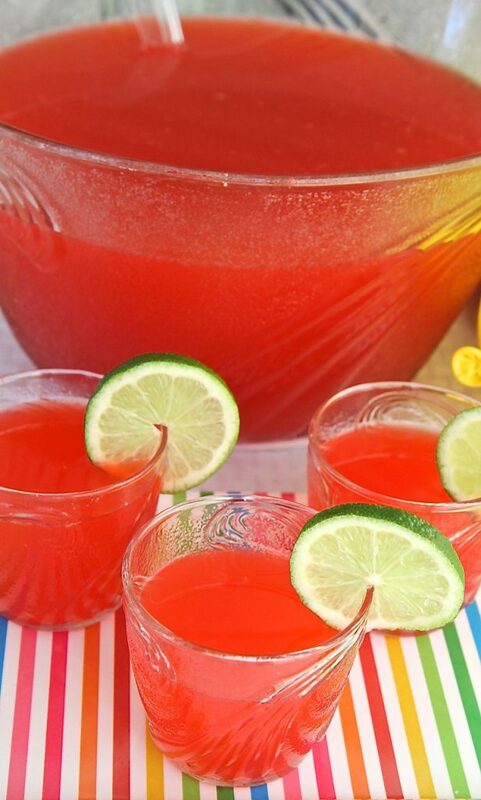 I have several on my blog like this strawberry margarita punch and this celebration punch! Oh and this Berry Beer Punch and Pomegranate Punch. Oh dang how could I forget about this Melon Ball Punch! Ok I’ll stop….just kidding, have you seen this Caramel Apple Punch I posted?!!!? I could def. go on but that’s a good thing because if this punch doesn’t look like your cup of tea, be sure to browse around the blog for other punch recipes that might tickle your fancy. Monique!!! What!! You’re Not Making Punch From Scratch??? Oh…wait… were you expecting to see a homemade fruit punch recipe? Awww sweetie I’m so sorry, bless your heart! You see here’s the thing… I don’t do homemade fruit punches. I did that once and nearly LOST MY MIND!!! All that gosh dern juicing and dicing fruit only to have it guzzled down in a matter of minutes! I wanted to cry! People were suppose to savor it. Take a sip and admire the glass full of my hard work! They were suppose to say “oh wow I can’t believe you juiced fresh apples, pineapples, grapefruit, watermelon and the other million fruits that went into this”. They said nothing!! That lead to the conclusion that folks could care less when it comes to punch! As long as it’s ICE COLD, SWEET AND NEVER ENDING! From that point on I’ve sworn myself to punches that I can just dump and stir in a flash. You feel me? Aint nobody got time for authentic fruit punch! Yes I said it!! As you can tell I’m still feeling some kind of way about that whole experience. 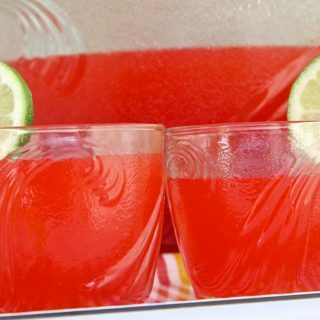 Now let’s talk about THIS Easy Party Fruit Punch!!! I have a similar recipe on my blog already but I’m always playing around with it. This version got a lot of “this punch is good!” when I made it for my summer luau last year. Since then it’s been one of my go-to’s for baby showers and never-ending kids birthday parties we have in my family. It really is a true crowd pleaser because my kids aren’t fans of anything fizzy, I’m not a fan of flat punches without fizz, my husband likes his punch mellow and crisp, I like mine super sweet and candy-like. I say all that to say.. we ALL love this punch! That’s saying something! It’s fizzy but not too fizzy. It’s sweet but not too sweet. Folks down this stuff by the cup full so you’ll def. want to make the full batch if you’ve got a big crowd. Stir together all ingredients in a very large bowl. Pour into pitchers three (1/2 gallon pitchers) and store in the fridge until ready to serve. 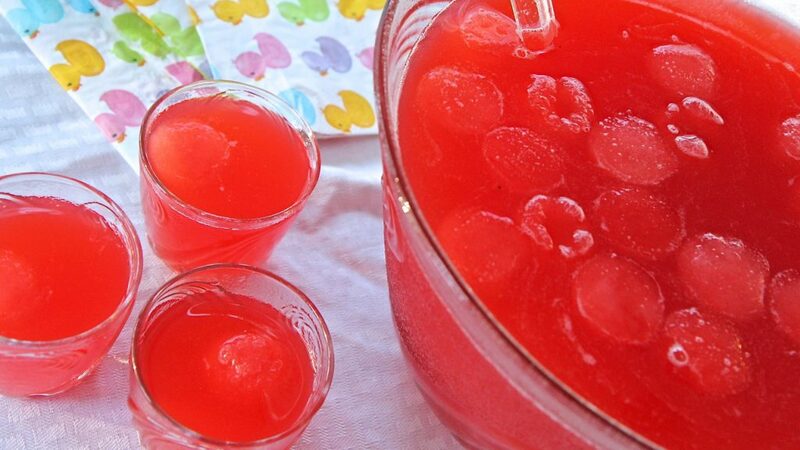 When ready to serve, pour punch in punch bowl and add frozen punch cubes. Can also add fruits like oranges and limes but I never do. 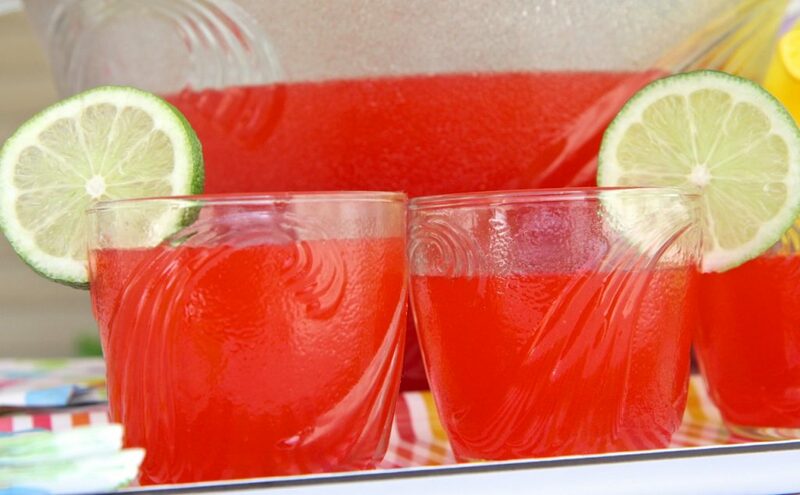 If you want the punch to have a stronger fizz, then add the Sprite and Sparkling Grape Juice when ready to serve. If you're nervous about the sugar then just add it gradually, tasting after adding a little bit, or if you aren't a fan of sweet punches leave it out. OMG I recently made this punch for a baby shower that got canceled so it was sitting in the fridge for a week. When I went to serve it for dinner it was SOOOO GOOD!!!! I guess all the flavors got a chance to really hang out. The fizz was gone but it was so icey cold that it didn't even matter! Hello! Thank you for posting a wonderful lunch recipe! My sister, her best friend, my mom and I threw by sister a baby shower and this was a huge hit (along with the rest of the shower !) 🙂 we DID NOT ADD SUGAR and it was sweet enough – followed recipe exactly otherwise! I actually was in a hurry and realized after but it would be wayyyyy to sweet w added sugar and wreck the taste! Oh and my sister bought all quality stuff like simply orange no pulp, dole pineapple, etc. All my sisters friends and myself were saying it would be good w vodka! Happy PUNCH! I was searching for lunch recipes today and saw this. I have one I swear by but it takes several steps and I didn’t have time. But you mentioned the icy cold – if you like that, try putting the punch into ziplock bags and freezing them for as long as possible before the party. A few hours before the party you can take it out, and let them thaw a little. Then add anything fizzy right before the party. It makes the punch slushy and cold.